DEW is a tool for communities to collaboratively map their best ideas and facilitate collective ownership and action to advance these ideas. Dew syncs online social networking and idea-generation with offline action for community, real estate, and economic development. It is driven by a map-based website, where users submit ideas for improvements to the places they encounter every day, and businesses submit needs to build market support. Dew’s approach is to aid the execution of user-generated ideas submitted to its website by building support through microfinance and collaboration. As executive officer, Derek is Dew’s glue, from inception through realization. He is a true collaborator and creative leader. A graduate of Calvin and Michigan, Derek’s work for Dew is a confluence of his diverse academic and professional work in architecture, planning, urban design, strategy and real estate development. Yuling serves as the fiscal strategist and caretaker. Originally from Hong Kong, Yuling has a keen interest in urban fabrics. She holds an MBA from Georgetown and an MS in facility planning from Cornell. Patrick is Dew's interface designer and works to make sure Dew gels. 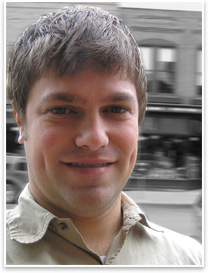 While interface and user experience design is a big interest, Patrick is also an architectural designer in New Orleans. A graduate of Harvard and Michigan, he's worked as a ski bum, legislative assistant, and construction manager. Dew's head programmer and analyst, Daniel oversees the deployment of all interface and backend development. A resident of northern Michigan, Daniel is one of the few people on Earth lucky enough to live on Lake Michigan. James serves as Dew's Chief Project Officer working to innovate and inspire communities towards sustainable development. James uses his formal training in architecture and experience in construction and project management to engage his passion for a bright, green urban future. James is currently working to train Detroit's youths in the skilled trades while developing an industry of reclaimed building materials.